Your tour begins in the French Quarter, where you'll board a comfortable, air-conditioned coach and travel to the quieter and more genteel Garden District. This elegant historical area, known for its marvelous examples of Greek Revival and Italianate architecture and lovely gardens, was once the site of a number of plantations. Learn from your guide how in the 19th century it was sold off piece by piece primarily to wealthy Americans who built the lavish mansions that still dominate this district. See mansions belonging to local author Anne Rice, actress Sandra Bullock, actor John Goodman, and former New Orleans Saints' quarterback — and father of Peyton and Eli — Archie Manning. 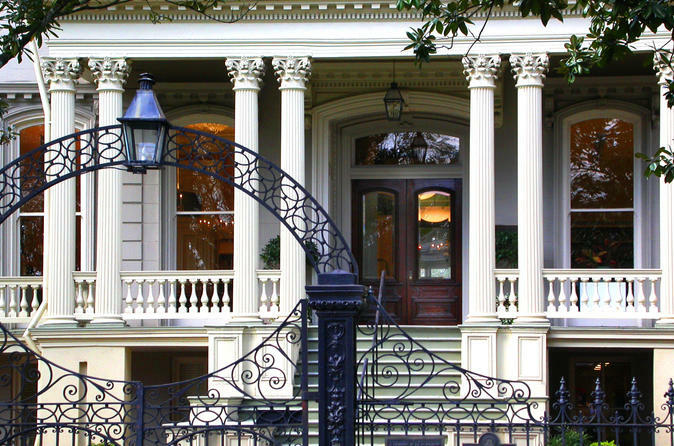 Stop for an exclusive tour of a stately Garden District home built around the end of the American Civil War in 1865. Admire an unusual cast-iron fence resembling a row of cornstalks and learn the legend of how a southern colonel had it made in the mid-1800s to comfort his homesick Iowan wife. You'll also see where Confederate leader Jefferson died at age 81 and stop to walk around Lafayette Cemetery, one of New Orleans' many above-ground cemeteries. Hear about how the high water table and frequent flooding in the city helped drive the creation of these 'cities of the dead' as you capture photos of the elaborate tombs and statuary. Enjoy light refreshments at Magazine PoBoy Shop before heading back to the French Quarter by coach at the end of your 2.5-hour Garden District tour.